WordPress is a powerful content management system that also works beautifully as a blogging tool. Learn how to tag and categorize your posts so they’re not hidden from your site’s visitors. In fact, it started as nothing more than a way for bloggers to manage and publish their content easily, so it’s no surprise that WordPress still supports all of the necessary features of a blog. Those include tags and categories. 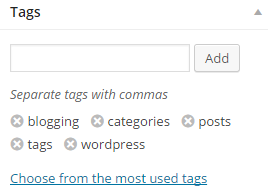 In this article, I’m going to cover everything you need to know about tags and categories in WordPress, including how to tag and categorize your posts. Why Tag and Categorize Your Posts? Tags have often been likened to the index of a book, while categories are more like the chapters. If you have a lot of information on a particular topic related to your niche, you can write entire blog posts on those topics and organize them into useful categories. This makes specific posts much easier to find for your readers. Tags, on the other hand, are used to organize information more succinctly. Many bloggers find that some of their tags are useful for posts in multiple categories. For instance, if you write a blog on backyard barbecuing techniques, then you might have categories for chicken, brisket and ham. Within each of those you could have a tag for ‘hickory-smoked’, as this phrase would be relevant for more than one category. Is it relevant to the overall niche you write within? Would readers use that tag to search for information about your topic? Is it a term that the average reader would understand, or does it contain ‘jargon’ or technical language that would make it obscure to the average reader? In general, you want your tags to be free of jargon or technical language, unless you are writing a technical blog. Is it short, or is the phrase too long? Is the tag appropriate for the blog post? You’d be surprised by how many bloggers use a tag that has nothing to do with the post itself. As you would expect, readers typically don’t find that helpful. Try to tag your posts in such a way that will help readers easily find information relating to your niche. Also, be careful not to use too many tags at once. Three to five tags is usually enough for each blog post. If you think of your categories as chapters in a book, your blog posts are subchapters; each one covering an aspect of its category’s topic. Categories generally cover broader topic areas than tags, so you should have fewer of them, assigning only one per blog post. The most important consideration for categories is relevance. Readers will search for information related to your niche, so make sure each blog post is categorized appropriately. When choosing a category for your blog posts, pick one that best fits the content and best represents where readers would search for the information presented. If you do that with every blog post, your categories should be rich with relevant, easily accessible information. The hardest part about tagging and categorizing blog posts is deciding which tags and categories to place your posts in. The easy part is doing it. When you’re on the New Post screen in WordPress, you’ll see a column of boxes down the right-hand side of the computer screen. The top box is labeled Publish. Below that is your Categories box. If you haven’t done so already, you should create 10 to 12 categories for your blog. When you are ready to assign a blog post to a category, all you’ll need to do is check the box beside that category name. Below the Categories box is your Tags box. You can usually create tags as you go, but WordPress has a link below the Add box that allows you to search existing tags. Before you create new tags, you should search to see if you have any relevant ones that you can use for your post. Otherwise, you’ll end up with a slate of tags that are similar in nature and name, which is counterproductive for both you and your readers. 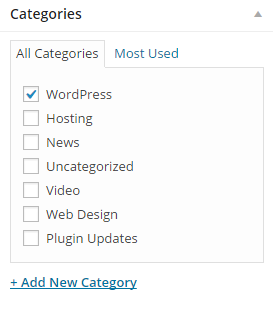 Categories and tags are easy to manage in WordPress. The best part is, you won’t break anything, so don’t be afraid to play around. Leave a comment and let us know how you use the tag and categorize features in WordPress.